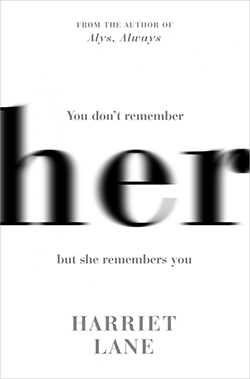 Her is the second novel from Harriet Lane, author of the wonderful Alys, Always. It is the tale of two women, Nina and Emma, who tell their own stories in alternating chapters. When the characters meet - or, more accurately, when Nina sees Emma in the street - there is an instant flare of horror, panic and fascination on Nina's side. Straight away it is clear that the characters have encountered one another before, and that whatever interaction they have had, it has left a mark on Nina - but not on Emma, who fails to recognise Nina. The plot presents an immediate, obvious mystery: what can possibly have happened between the two women to make Nina obsessed with Emma, while Emma doesn't remember Nina at all? After a period of contemplation - 'I'm scared of seeing her, and I'm scared that I'll never see her again' - Nina finds a way to initiate contact with Emma, and strikes up something Emma sees as a new friendship, but Nina (and the reader) knows to be a deliberate and carefully plotted campaign to insinuate herself into Emma's life. For her part, Emma is quickly taken in by Nina, the kind of cool, calm and collected woman she wishes she could be. Emma is an immediately likeable character, the sort of person everybody knows multiple versions of in real life, friendly and rather unremarkable, nice but (on the surface) altogether ordinary. She is clearly on the very-privileged side of privileged, but struggling in a number of ways, and has none of Nina's composure. Although she loves her children, motherhood has not been what she hoped (and I have to say, if I wasn't already horrified by the idea of having kids, I probably would be after reading this). Emma is always tired and unkempt, is jealous of her husband's ability to continue with his career unaffected, and feels lonely, distanced from both the world of work and any sort of social life. Her emotions towards both her husband and her children switch between love and resentment, and overall, her existence is one of exhaustion and perpetual dissatisfaction. Emma resembles the 'put-upon young mother' stereotype so common in popular contemporary fiction, but here the well-worn caricature is fleshed out into something that actually resembles a real person, someone you can understand, relate to and believe in. Sometimes it felt as if Arnold, with his confidence and generosity and taste, had willed me into existence, suggesting as much as fostering the characteristics which are now so much a part of me. He turned my shyness into reserve, my guardedness into self-possession. He brought me out of the shadows. All this talk of 'finding yourself': often, other people show you yourself first. If Arnold was Nina's ticket to the life, and the self, she craved, he has long since been discarded; tellingly, 'he knew too much. He'd seen both sides.' Nina is an artist, but it seems as though she has enough money to stop working, should she want to. There is clearly no financial or social motivation for her pursuit of a friendship with Emma. Nina often alludes to the idea that Emma was once 'perfect' and has somehow fallen from grace - something she regards with both delight and disgust. Every aspect of Emma's life provokes an obsessive instinct in Nina, and there is a manipulative cruelty to the way she pursues her quarry with small, insidious acts, but this preoccupation with Emma is one of the only things that rattles Nina and therefore one of the only things that humanises her. In the opening pages, her feelings upon sighting Emma are 'overwhelmingly powerful: like panic, or passion.' It's these cracks in the armour, these glimpses of vulnerability that make you desperate to get under the skin of the character. I've read some reviews of Alys, Always that criticised it for being a psychological thriller that wasn't thrilling enough. I don't agree with this assessment at all, not least because I don't think Alys, Always actually is a psychological thriller, and also because that absolutely isn't the point of the story, but anyway. My point in mentioning it is that I am sure that those readers will feel the same about Her, which has also been positioned as a thriller: when the Big Reveal of the Big Twist comes, the moment the whole book has been working up to, it isn't anything much at all. Does this mean it's disappointing? Not at all - quite the opposite, in my opinion. The fact that the root of all this is such a tiny thing, and something entirely beyond Emma's control or even knowledge, makes it all the more delicious, strange and unnerving. It also suddenly tilts the character of Nina entirely and makes her seem much more unhinged than the reader may have previously supposed. This sets the tone for a dramatic cliffhanger ending which leaves the characters' fate, and the aftermath of these climactic events, open to the reader's interpretation. I don't say that I've read it and enjoyed it, though I found the final plot twist unsatisfying, as plot twists often are: nothing like life, which - it seems to me - turns less on shocks or theatrics than on the small quiet moments, misunderstandings or disappointments, the things that it's easy to overlook. 'I don't think I like these characters,' he's saying: an annoying remark, one with which I can't be bothered to engage. I didn't find Her to be as immediate or as continually gripping as Alys, Always, but after finishing it, I couldn't stop thinking about it for weeks. It took me a while to get round to writing this review but, once I started re-looking at the book to jog my memory, I found that I really wanted to read it again. Her doesn't grab you by the collar and refuse to let go: it creeps up on you and worms its way into your head until it feels like a part of your reality. Nina and Emma are so fully-formed and well-realised that I find it almost impossible to believe they aren't out there somewhere, living these lives. This is a tightly plotted novel that is taut with suspense but, more than that, it is a wonderfully intricate, rewarding character study that demands to be re-read and savoured. I received an advance review copy of Her from the publisher. I absolutely loved Alys, Always and this sounds in the same vein - insidious and clever, in a very subtle way. I just can't wait to read this. I skimmed parts of your review for fear of spoilers, but am glad to hear you enjoyed it as much as I hope to!